Thanks to almost everyone having easy internet access, lots of hobbies have experienced a surge in interest in the last decade. Access to how-to videos and guides is easier than ever, and many supplies for craft-based hobbies are much easier to access. One of these hobbies is soap making. Lots of people are now trying out making their own homemade soaps either to use or sell, but many of those people are finding that their supplies take up a lot of space. This is where a storage unit can help. A storage unit, especially one equipped with climate control options, is an ideal place not just to store supplies, but even to get some vital work done. 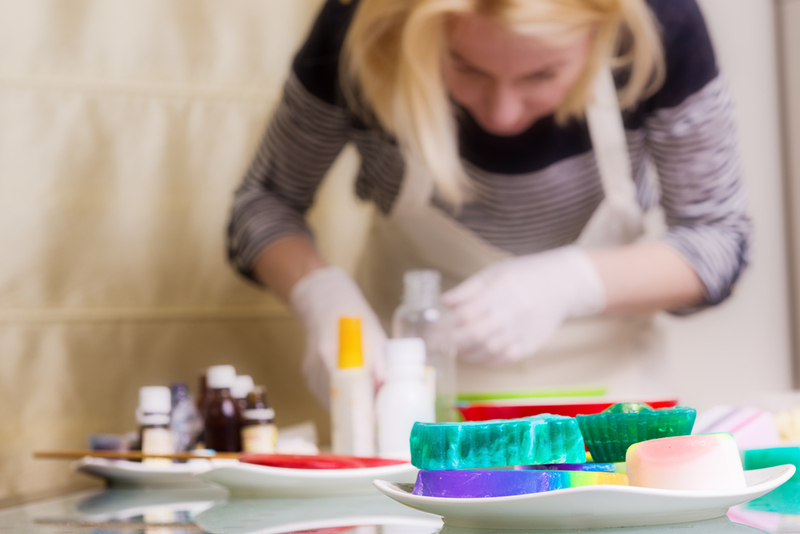 Affordable Family Storage’s team likes to offer advice, so in this blog, we’re going to look at how a storage unit can help you with your soap making hobby. Soap is made through the combination of fat and sodium hydroxide (also called “lye”) and a liquid, which are mixed together until they’re thick. This thick substance is put into a mold and left for about 24 hours, until it “saponifies,” or turns into soap. There are plenty of options out there for consumer soaps, but what’s great about making your own is discovering just how versatile it is. You can add or remove certain ingredients to change the scent, color or texture of the soap, as well as formulate it to your skin type. The important thing to remember when deciding to make your own soap is that it takes a lot of time, patience and careful learning of the craft. Once you get the hang of it, it can be a fun and financially lucrative hobby. There are four ways that soap is typically made, melt and pour, cold process, hot process and rebatching. The melt and pour method involves using pre-made blocks of soap and adding your own choice of fragrances. Cold process is the most common, and this is the method that involves different types of oil and lye. Hot process is similar, but the soap is heated or cooked. Rebatching is a method by which existing soap is repurposed by melting it down and adding additional ingredients. All of these different methods have their pros and cons, and we suggest you do thorough research and maybe try out more than one before you commit to a certain style. There are countless resources available online from experienced soapmakers that offer a great amount of detail in handy, simple guides. This is where your storage unit can come in handy. If you’re just starting out, you might not have that much equipment or supplies taking up space. But if things pick up, you’re going to find yourself filling up more and more of your existing workspace with soap-making supplies. Having a storage space to keep all of this will free up much more space at home. There are some important safety factors to remember when it comes to making soap, mainly with the use of lye. Lye is a caustic substance, which means that it can easily burn your skin. Inhaling or ingesting lye can also be extremely dangerous, so you need to make sure you can work somewhere that’s ventilated. You should also protect your hands, face, arms, and forearms. Ideally, your storage unit should be used for storing supplies for your soap making. When it comes to getting the actual work done, make sure you’re doing it somewhere suited to the task. Once again, we recommend looking up some of the in-depth and detailed guides about safety in soap making that are available online. If you need a storage unit for your soap making, or for anything else, contact our storage rental team at Affordable Family Storage. Climate-controlled storage facilities are great not just for more delicate valuables, but anything that needs to be kept at a constant temperature to stay in good condition. Whatever you’re looking to store, come to Affordable Family Storage for your Ozark storage solutions.